Winter in Victoria = burning desire to warm up so Wyndham Marcoola, SE Queensland here we come. Just 4 days off work so the short flight from Melbourne to Maroochydore is just what we want. 3 minutes in a taxi and big smiles are welcoming us to our home away from home. Thanks guys – such a nice way to start our holiday. Up the lift and into our apartment – wow, wow and wow!!!!! Huge windows frame the stunning view – straight out over the nearby dunes and onto the surging seas. You’ve just got to visit this place to understand how pretty it is and everything is so convenient. 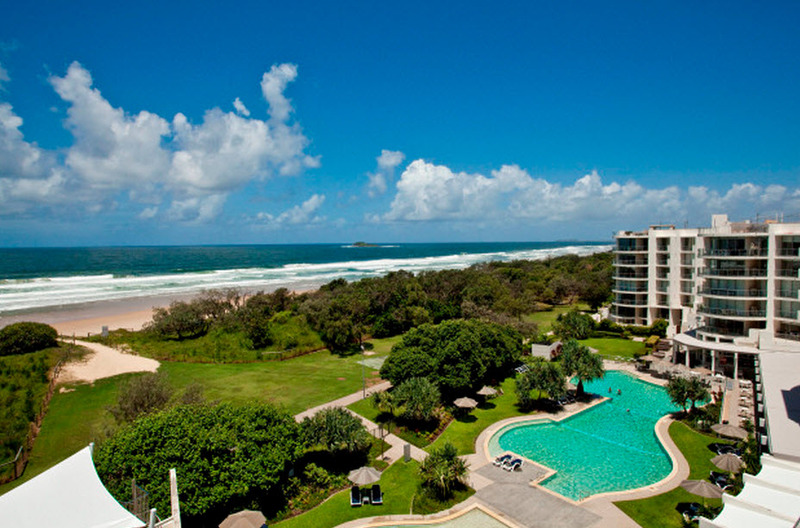 Beach, surf, lawns to play on, enticing pool and all of this is on show from our room and the balcony. Downstairs for dinner which was scrumptious and in peaceful surrounds. Our first day over and the planning begins for what to do with our next 2 days up here. No car, no worries. The bus stop right out the front takes us to all the shopping on offer at nearby centres; beach and café set at Caloundra and north to Noosa. Back to “our place” and time for walks along the beach and hubby is off to the gym to work off the excesses of holidaying! Me, up to the balcony to stretch out and soak up the last of the lazy days. All too quickly our time here is done and we have to head home. We will be back but next time we will travel with friends with kids because there is just so much for them to do too. It was perfect for our romantic escape (celebrating our Anniversary!) but would be so, soooo good for families – we almost felt selfish having so much to just us – great food, ideal location and did we mention the room – the views. Oh, and by the way for all you cleanliness freaks – good luck finding anything to do – the rooms were faultless – spacious, fresh and meticulously clean.